Author(s) : GILL John H.
When Napoleon’s Grand Armee went to war against the might of the Habsburg empire in 1809, its forces included more than 100,000 allied German troops. From his earliest imperial campaigns, these troops provided played a key role as Napoleon swept from victory to victory and in 1809 their fighting abilities were crucial to the campaign. With Napoleon’s French troops depleted and debilitated after the long struggle in the Spanish War, the German troops for the first time played a major combat role in the centre of the battle line. Aiming at a union of German states under French protection to replace the decrepit Holy Roman Empire, Napoleon sought to expand French influence in central Germany at the expense of the Austrian and Prussian monarchies, ensuring Frances own security. The campaign Napoleon waged in 1809 was his career watershed. He suffered his first reverse at Aspern. Victory was achieved at Wagram was not the knock-out blow he had envisaged. 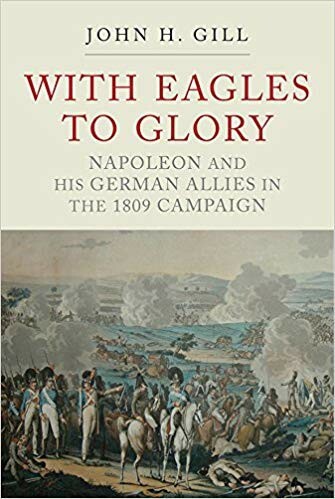 In this epic work, John Gill presents an unprecedented and comprehensive study of this year of glory for the German soldiers fighting for Napoleon, When combat opened they were in the thick of the action, fighting within French divisions and often without any French support at all. They demonstrated tremendous skill, courage and loyalty.